Black hair is a very sultry and chic color, but it doesn't suit everyone. Whether you've decided to try black hair and just didn't like it, or your hair is naturally black and you'd like a change, you can dye black hair brown and achieve a beautiful result. When lightening hair, it's important to consider whether your hair is naturally black or you obtained the color with black hair dye. If your hair is naturally black, and you haven't dyed it in the past, this is called virgin hair. Virgin hair lightens really well and the process is generally much easier. Dye, on the other hand, can be more stubborn to remove, and it is best to use hair dye remover as a first step to try to remove as much of the artificial color as possible for a healthier, even result. 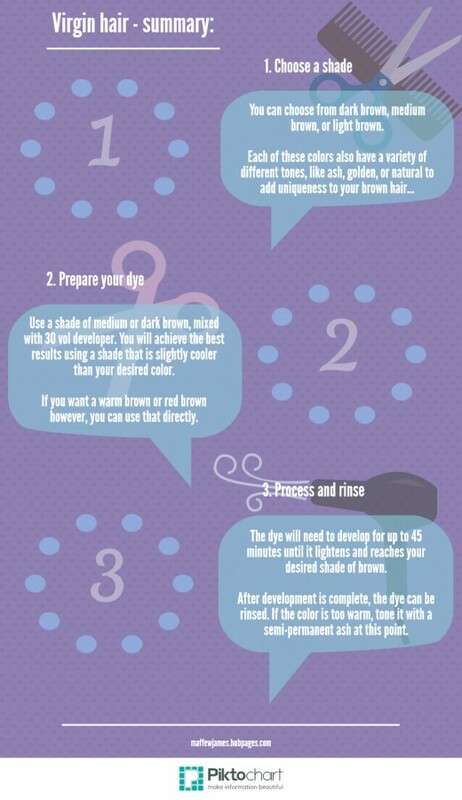 Because of this, the process of dyeing your hair brown is different if you've dyed it before. Virgin hair contains no artificial color and it is much more responsive to chemical treatments. This means that it can be lightened without bleach. This is in comparison to hair that has been colored with hair dye and needs to be lightened with bleach if you wish to go a lighter shade than your current color. If you're working with virgin hair, all you will need is the desired shade of brown hair dye, a bottle of 30 vol developer, and the usual dye application tools like a tinting brush and bowl. The more concentrated 30 vol developer is mixed with the dye in order to give it the lift needed to lighten your hair and dye your black hair brown, whilst the dye itself will tone your hair to the desired shade as it lightens. This will work for a dark brown or medium brown result. If you'd prefer a light brown color, you will need to pre-lighten your hair with bleach first in order to ensure it will be light enough. 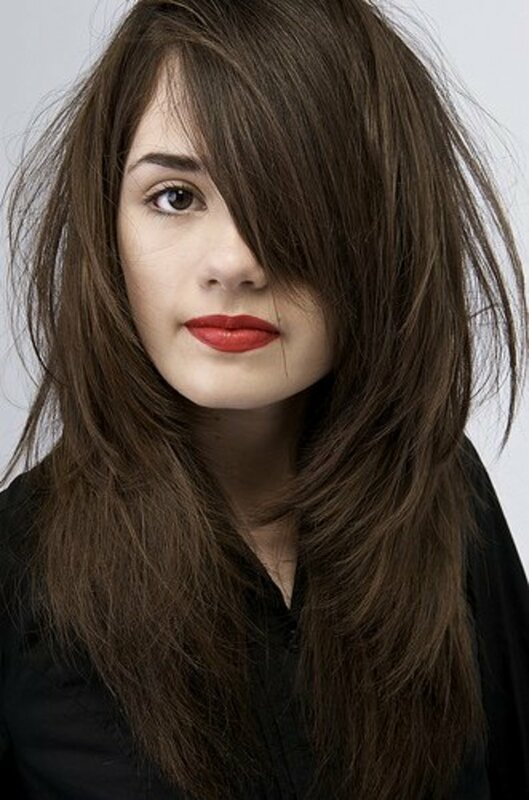 After this, you can tone it with a light ash brown dye to neutralize the warmth and achieve a light brown color. The process here is the same as if you had dyed your hair black. A useful tip when you are dyeing hair a lighter color is to use a hair dye shade that is cooler than your desired shade. Whenever you lighten black hair, lots of red and copper pigment is revealed because the base tone of your hair becomes visible. In order to dye your hair a nice shade of brown, you not only have to lighten it, but neutralize these warm tones so that the color looks natural. If however, you would like a red shade of brown, stick to the precise shade. In this case you don't need to cancel out any of the warm tones. Any warmth that is revealed will work to your advantage and allow you to reach a more vibrant shade of auburn. When you choose a dye, use ash brown shades for a natural brown result, and natural brown shades for a warmer result. For auburn shades and other shades of red brown, use the exact desired shade. For this process, you can reach a level 4 medium brown at most. If you want a lighter shade of brown hair, you will need to bleach your hair before dyeing it. When you dye your hair, you will always get the best results by using a high quality professional salon brand. Choose shades from brands like Indola, Matrix, Wella, and Igora for great results every time you dye your hair. The shade of dye you have chosen needs to be mixed with developer before it can be used. The developer not only works to lighten your hair, it drives the entire dye reaction and makes the dye permanent. For tone on tone dyes, you would use 10 vol peroxide to dye your hair with very little lightening. However, to dye black hair brown, you will need to use 30 vol developer in order to maximize the lightening effect. 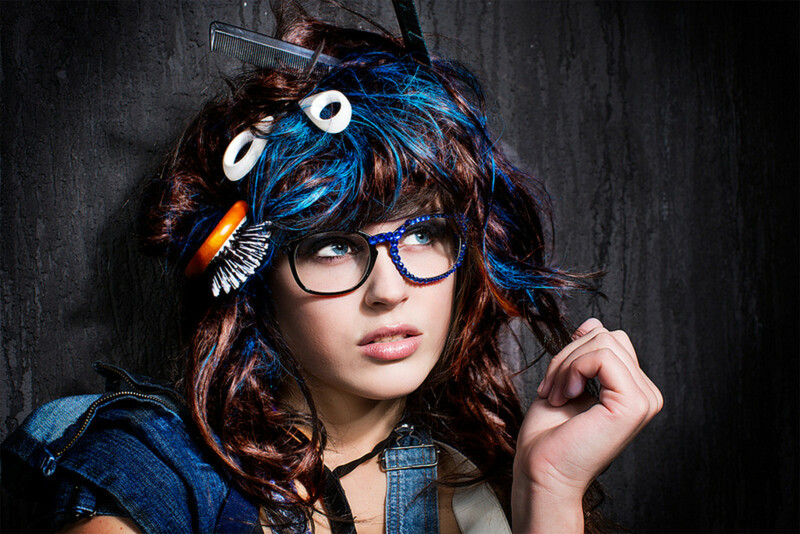 Developer is usually added to dye in a 1:1 ratio of dye to developer, though this can vary with manufacturer, with some hair dye manufacturers recommending a 1:1.5 ratio. Use the ratio recommended by the brand you have chosen and mix the dye up using your tinting bowl and brush. To apply the dye quickly and accurately, it is important to section your hair properly. The easiest method to do this is to divide your hair into four individual sections. You can do this by parting the hair down the middle from your forehead to the nape of your neck, then again from each ear, clipping the individual sections aside. This leaves you with four quadrants to work on. Now that you have your hair sectioned in quadrants, begin applying the dye to your first quadrant from the back of your head, working around to the front. The way you have sectioned your hair will allow you to apply the dye very quickly and this is necessary for even lightening and a natural looking color. When you apply the dye to a quadrant, pick up thin layers of the section you're working in and brush dye onto both sides of each layer, working down from the top of the quadrant until you've completely covered that section. Move through each section like this and you'll be done in no time. Development time is the critical factor now. For maximum lightening and to reduce fading of the final color, you need to leave the dye on for the full recommended time of your hair dye brand. This is usually 45 minutes. You can take this time to relax and prepare to wash the dye out. Once the developing time has passed, rinse out the dye and enjoy your new color. If your hair has been dyed black, you can't use another hair dye to strip out this artificial pigment. The popular hairdressing maxim that 'color can't lift color' reigns supreme here and you will need to use bleach first to pre-lighten your hair. This is a two step process, but it isn't that much more complicated compared to a virgin application. Dyed hair won't respond to another hair dye and you will need to bleach it to lighten the color first. For this process you will need powder bleach, 20 vol developer, and hair dye application tools. The powder bleach is mixed in a 1:2 ratio of powder to developer unless your brand specifies a different ratio. You will guarantee the best results by using a quality brand like Wella, Indola, or Matrix. To apply bleach, divide your hair up into the four quadrants explained earlier and begin applying the product to each section just like you would apply a dye. In this case, you will need to work with a decent speed to ensure the lightening is even, so if you aren't able to apply it quickly, you would be best to practice your skills before you decide to use bleach. Once you have applied the bleach to your entire head, allow this to process for up to an hour, checking it every 5 minutes as it works. It is not likely that it will take the entire hour to strip out the black color, so checking the bleach regularly is very important. You only need to reach a deep red color for dark brown, red-orange for medium brown, or orange for light brown. You can rinse the bleach out once this has been reached. At this point your hair will be an orange or red colour. This isn't the final result. Bleach is used to remove color from your hair, but you can't use it to dye your hair brown, just like you can't really use it to dye your hair a nice shade of blonde. To transform this red shade into an actual natural shade of brown and finish the process, you will need to tone your hair with a dye. A bleach bath is a milder way to lighten your hair or remove dyed color. Discover the benefits and learn how to use it. When you dye virgin hair with a hair dye, the dye lightens and tones your hair in a single process. When you bleach your hair, this toning has to be done separately because bleach can't add tone to your hair. For this you will need an ash brown shade of hair dye to neutralize the red base tones and form a natural brown color. The ash dye should be one shade lighter than your desired color. For this process, you can use a permanent dye for lasting color, or a semi-permanent dye to tone it without causing any chance of damage. The caveat here is that a semi-permanent dye won't hold as well and will need to be repeated every few shampoos to maintain your color. It is best to use a permanent shade to add permanent tone back in and follow this up with a semi-permanent dye should you need to refresh your brown color. If you're using a permanent dye as the toner, mix this with 10 vol peroxide and apply it the same way you applied the bleach by working through quadrants of your hair. When the dye has been completely applied, allow it to develop until the warmth in your hair has been neutralized and it reaches your desired shade of brown. Your new color is beautiful, but in order to keep it that way, it's important to care for it properly. In particular, you will need to tone it every so often as warmth creeps up when the dye begins to fade. 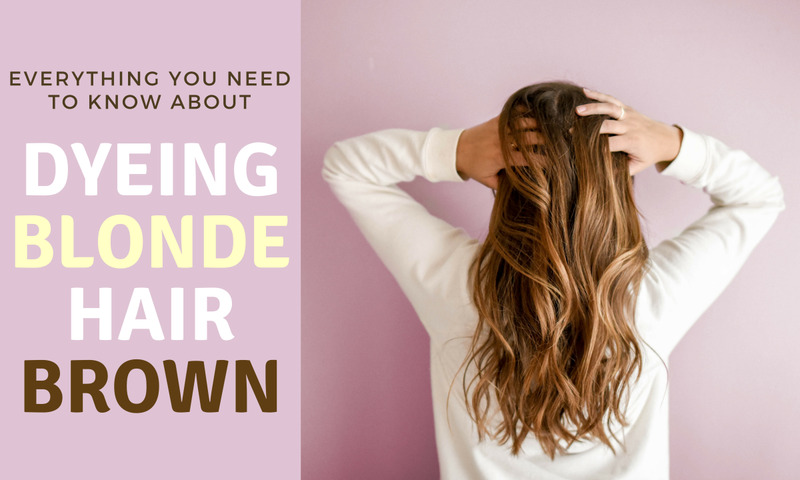 Fading is unavoidable when you dye your hair, but occasional toning will allow you to keep your desired shade as vibrant as the day you dyed it. If you have a question about dyeing black hair brown or an experience to share, leave a comment below for tailored advice and share your insight with other readers. I have been dying my hair black for 10 years. I have bleached and coloured so many times that you think I would learn my lesson and stop. After having to shave my head from bleaching too many times, my hair has grown to a short bob which I dyed black again and again (naughty). Anyway I'm over the black and couldn't resist the bleach AGAIN... I used Colorista bleach and saw no results until I washed it out. I am so happy! Although it didn't go blonde at all, it also didn't go orange. It lifted to a beautiful chocolate brown. I don't know if everyone would get these same results but for it to go brown and not orange was a breath of fresh air! My hair is dyed black but its slowly starting to fade into brownish red. I would like a medium ash brown tone but i want it to come out even. How would I apply the bleach to make sure it's even? Your article is very helpful.plz tel me can i dye my jed black hair into meium copper brown?and golden streaks in it? Hi. Ive very very dark brown/soft black hair and i wanna dye it to a ashy light brown kind of like a sun kissed caramel shade . If i use bleach and then dye. Can i do it on the same day? Won't it be too damaging? i have 5 inches of roots which are my natural colour (light brown) and the rest is a bleach blonde but currently is purple, I want to try dyeing my hair black so I was thinking of using a semi permanent dye, will this work? Will it fade to an awful colour? Can colour remover get rid of the black after I'm bored of it? If not how can I get light brown after trying the black? I have 6 inches of virgin hair from roots and below my hair is 10 inches and has been previously bleached and dyed with a semi permanent dye. I would like to go to a chocolate brown like in the photograph at the top of the page. If I used colour remover would I then need to dye the virgin roots with a 30 vol and permanent dye, and then treat then the previously bleached hair with the same dye but using a 10 vol? The previously bleached hair was taken to a pale yellow originally. Thanks this is a great blog! I forgot to add... I used a level 7 demi gloss recently to tone down some of my grown out highlights (which will be lopped off before I do any more coloring). Does that mean that my level 4 hair isn't virgin anymore, even though 7 is a much lighter shade and not permanent? Great article! You say "A useful tip when you are dyeing hair a lighter color is to use a hair dye shade that is cooler than your desired shade." What if you want to lighten dark hair by a shade or two, but you also have some gray hair (in my case, only 10% at most). My hair is about level 4 neutral/ash, and I want to go to about a level 5-6 neutral/beige. I thought I'd use a level 6 ash to cool down the warmth that will happen from lifting, but will my gray hairs then turn some really weird shade? Hello, I went to a professional senior color specialist. I have very dark brown hair and used to dye it w/ a semi (same color to cover little grey) 3 times a year. I wanted to go a light brown hair color. I was recommended highlights w/ medium brown, light chestnut and medium chestnut. When my hair was finished it only looks a shade lighter than what I had and the light chestnut, instead of looking light brown looks copper orange. Is this normal? I was told that it will take 3 or 4 times to achieve a light/medium brown hair color. Is this true? All of the lighter colored parts of the hair don't look that light to me other than a bit of copper tone to it. I was told they did use a tone. I have virgin black hair but itsa little like 99% lightened due to the sun. I want a medium r light brown color. If i use dark ash blonde hair dye, will I be able to achieve the brown without turning it blonde? So I have a natural black hair and I wanted to dye it to light brown, I want the lower half of my hair lighter than the upper half so what vol. of peroxide should I use with the bleach and what volume should I use with brown dye?? This is such an interesting site. Thank you. I have dark brown to black hair. I grey very quickly at the roots. When I color the greys I just have the roots done with dark brown. I now would love to do cap highlights with a light ash brown. I have read lots of your replies to the questions. I know there is no other way but bleach. Please tell me how to look after my bleached highlighted hair so it won't be damaged very much with all these chemicals. Thanking you in advance. So I see you respond , and have been all over the internet looking for an answer as to what to do. So I'm dying my hair tomorrow but do not know where to start. I dyed my naturally Reddish Brown hair Black. I dyed it about 8 months ago. So now my roots are showing and my black has red showing throughout my hair (I believe from washing out). And would like to dye my hair to a Brown that will accent my natural color. So thAt when it grows out it compliments eachother. I don't mind bleaching, as I know how to care for its damage. But what would you recommend? My girlfriend wants to dye her hair brown. Thank you for the advice. It was nice to know that if you haven't dyed your hair before, the process is generally much easier. I will let her know that she should give it a shot. Thank you for the advice. I am Asian and have black hair. I've died it perhaps 6 times so far. I died it myself for the first time in June, with Ganier soft black. Then, yesterday I used Koleston 33/0 intense dark brown (with 6% developer), thinking I was going to have brown hair. But it turned out black, without a trace of brown. After reading this blog, I think I understand why the resulting color is not what I wanted. But I don't really want to go through the process of bleaching my hair then redye it brown. Is there a way to dye my hair a darkest brown color without going through the bleaching? My natural hair color is black .i dyed my hair in 2013 with a dark brown shade of garnier naturals but it didn't work well on my hair.i feel no change .now i want to dye my hair with a golden brown shade .and i want some change .my hairs are no in good condition these days.i am facing hair fall probs but i want to dye .please guide me.. I have virgin black hair and want to lighten just very slightly . When I used to get perms , my hair was slightly lightened that I liked. This is the amount I would like lightened. 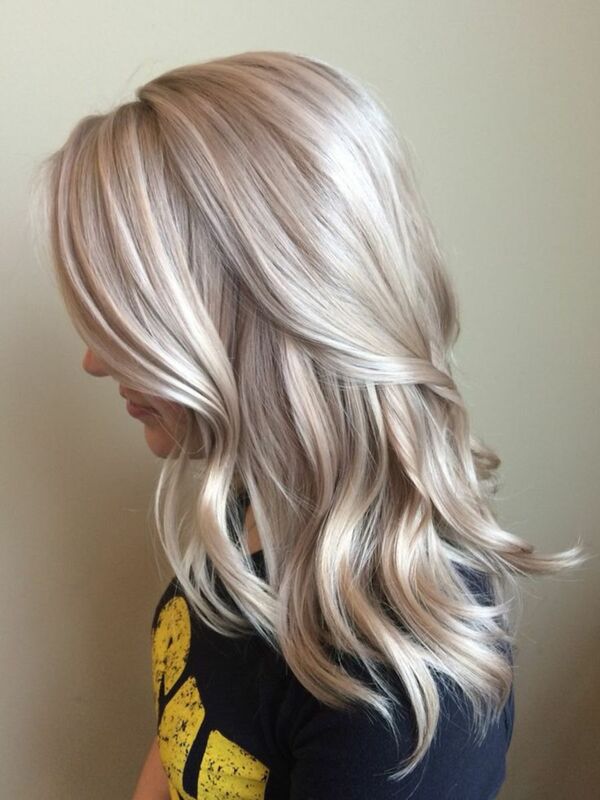 Could I achieve this lightening / almost ash brown look with a semi permanent color without lightening ( bleaching) first ? Or is it best to use a permanent hair color ? Thanks again, it's hard to find well written content online, let alone original and useful content. I'm very glad I found this site, nailed it! I have black virgin hair and I dont know much about hair dyes but my mom asked me to do a black gloss sometime ago. I just found out from my stylist that i cant bleach my hair to any brighter colour evenly if i dyed my black hair black. Is there really no other option? i really wanted a grey beige balayage :( please give me some advice or solution. Thankyou! so glad I found this blog. I have dyed my hair black and it has been this way for about 2 yrs now. I have gray roots coming in. I am tired of dying it every other month. I went to a stylist to see if I could just take it from black to gray. One stylist said yes but the other told me no, that it would ruin the texture and integrity of my hair. Do you have any advice? I have natural black hair but I have now a ombre on it. I want to dye it with a natural brown color. I was thinking to use first a remover hair dyes, after that I want to applied the ash brown color with 20v. And one week after I want to do my highlights I will do it with a cap, bleach, and the ash brown color bc I don't like red tone at all and I will mix that color with 10v??? Bc the hair it's bleached already? ?? Can you tell me it's this all its possible?? I will use SALERM PRODUCTS. Heya, Just did this via a professional hairdresser, but wish to reverse it as I found that I prefer my almost-black natural hair. First time getting it dyed as well. Any way to remove the colour so that I can have my natural hair colour back? I was wondering if I could dye my hair like that? Although the length of my hair only reaches my shoulder, I really like the model's hair color. I believe it is highlighted all over, but the root of the hair is like light ash brown? I was wondering what products I could use to dye my hair like that! also is it possible not to use bleach to get that ash brown color? My hair stylist once got my hair platinum blonde with just hair dye though I had to go back to salon the next day for second dying process. I really want to keep my hair undamaged and shiny like the model's hair! if there is any product I should be using with the hair dye to lessen the damage from hair dye, please recommend too!! I would be more than appreciative if you could advise me on the hair color (i am not sure about the numbers of hair dye...and what color the model's hair exactly is), what products (was planning to buy wella's koleston perfect from amazon, i think that's what my stylist used on my hair) I should be using (i did not know what developer was until i read your post) and any other products I should use to achieve the shiny and beautiful colored hair!! !Thank you very much! The product you've mentioned is a dye remover and this will act to remove the permanent black dye by reversing the chemical process that makes it permanent. As you've only had your hair dyed black once following its previous colour, there is a good chance that the dye remover will remove most of the dye, but black dye itself is very concentrated and this can't be guaranteed. It's possible that the product will only remove part of the dye. With the use of dye remover, the results you get are completely dependent on how light your hair is underneath the black dye. As the dye remover can only remove permanent dye, it won't lighten any natural pigment underneath. This means that in order to get to blonde, your hair needs to already be light brown underneath the black dye. The remover can only take you to the lightest level you've previously been. If it's not light enough underneath, which is likely if you've only ever used dark brown and black dyes, you'll need to lighten it further before toning. To do this, it would be best to apply bleach to take it to the required level, but you could also use light brown dye with 30 or 40 vol as the developer. Dye will be significantly less reliable in terms of lightening in your situation because you're working with hair that has been colored with dark dyes. Any subsequent dye you use at this point has a reduced effect because you begin to get a buildup of artificial pigment that is more stubborn than natural pigment and won't be lightened by the new dye. Ideally, if the dye remover strips most of it out, this problem can be minimised. When you do get to toning, the process will be slightly different if you bleach than if you lighten with dye. Bleach only lifts colour, so you'll end up getting a very orange to red result before you tone it, and it is easiest to apply an ash shade in demi-permanent for the toner. This is then watched and allowed to process until you're happy with the amount of warmth that is present. For a caramel shade, you don't need to neutralise too much because the caramel is a warm colour, but you still need to add ash to take it from an intense orange to a natural looking colour. You can use light ash brown for toning medium caramel, or dark ash blonde for a light caramel. The darker the ash dye used for toning, the quicker it will process and change colour, so feel free to drop the level down further if your hair is porous and likes to soak up a lot of colour when dyed, but don't go too light with the shade choice because the lighter shades of ash blonde tend to be more violet dominated in most brands at this point to deal with the yellow tone. 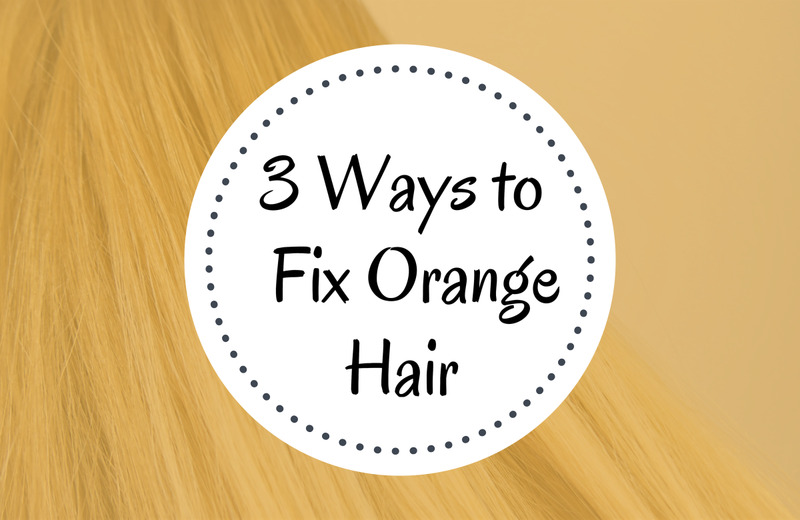 Orange isn't often present at lighter levels and these dyes won't tone your hair properly as a result because they don't contain enough blue pigment. If you used dye to lighten, you can also aim to tone with this in one process too, or you can double process it like with bleaching and simply focus on using the dye to lighten. The developer mixed into dye 'develops' the dye molecules by producing a chemical reaction that makes it permanent, and this same reaction is responsible for lightening so shade choice has little bearing on this. The shade used mainly determines how the colour will look following processing. Ideally, for a warm shade like caramel, use light natural brown, or dark natural blonde depending on whether you want a medium or light brown result respectively. The natural shade contains less cool tone than an ash and will leave it closer to caramel after coloring. You may still need to adjust by toning afterwards depending on how your hair reacts though. As for the roots, if this is your natural colour only, and no dye has been applied here yet, the dye remover will have no effect on the colour here and it will remain darker as a result. If there is a large difference between the lengths and roots, do apply bleach or dye here first, and then to the lengths about 5 - 10 minutes in, or when the roots start to get close to the depth of the lengths. Keep in mind that the roots will lighten quicker than the lengths because they're not previously dyed and are closer to the warmth of the scalp, so it's preferable for the roots to still be slighter darker at the point when you apply to the lengths to get an even result. You can correct it further when toning if required by using permanent dye as the toner, with 20 vol developer applied to roots, and a 10 vol preparation applied to lengths. This will depend on what your hairdresser has attempted to use thus far to lighten it. If they've tried dye remover and bleach bathing and it won't budge, this is a problem and you'd need to use bleach with at least 20 vol to lighten it to any extent. If your hairdresser has only tried to lift it with dye, or very mild bleaching, this won't do much because of the sheer amount of pigment in your hair after being dyed black. Another dye won't lift through it because dye itself is better suited to lightening natural pigment than it is artificial pigment like that of the black dye. In this situation it should lift fine with bleach, and the medium brown you want is reachable in one process because it won't need to be lightened too far for this new colour. Ideally, you want to lift it to level 5 if possible, and then dye it with the medium brown. This will give the best result because the hair has been lifted light enough that the new shade will cover properly without showing warm red tones that persist from the black dye. In any case, you need to at least get it to level 4 for a medium brown result, and if you can't get it any lighter than this, you may see red tones persisting into your new brown shade. This can be corrected by using an ash shade, but the amount of toning required to cancel out the red can push it darker towards a dark brown colour rather than medium brown. I had dyed my hair black before and now I want to dye my hair a mid brown colour as black is too harsh for my skin. My hairdresser has tried to lift it and tried highlights and nothing is lightening my hair it just looks a million different colours. Is it best to just strip it? And then dye my hair Brown? My hair is naturally a medium brown. I first got a perm to have loose curls because my natural curls were going limp. The length was almost to the bra strap. A few months later, I dyed it black for an occasion. It's been 4 or 5 months since then and the perm has grown out about halfway(length is still at bra strap). I have touched up the roots with black but I desperately want my hair to be a dark brown or darkest brown with not a lot of red. My original hair color is too light for me now and I would look washed out. I have a huge problem with frizzy ends and I'm worried about damaging it any more. I haven't been to a salon yet because I'm scared of what they would do to it and the cost. My mom(an experienced hairdresser) has been doing my hair but she is worried to try something different because she has been out of practice lifting black hair and she is scared of causing more damage. Please, please, please help me with my hair and give me advice on what I should do! I would appreciate any help you could give me. Thank you for reading this. I have virgin black hair and I want to lighten the ends to a dark brown color. I want the color to be noticeable but not too light at the same time. I also want it to look really natural. 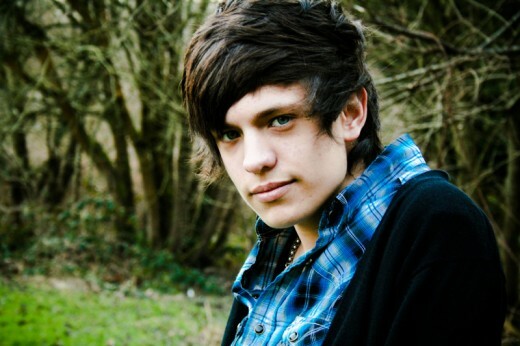 Should I go with an ash dark brown? I have a base color in between a 6 and a 7 shade. Would like to put highlights in like a nice creamy beige colour but don't know what product to use for the best results or the toner . Would be grateful if you could give me your advice on how to do this. Do t know what bleach is best could you talk me through it step by step,to achieve a nice color blonde not orange or yellow. As your hair is almost black and you would like to ensure a really light brown result, it would be better to use bleach for pre-lightening. A dye won't be reliable in this situation, though it can work. To do this, bleach using a quality bleach powder and 20 vol developer until your hair is bright golden-orange, and then tone it using a mix of half light ash brown, and half dark ash blonde. The reason for the mixture here is to get it somewhere between the dark blonde and light brown stages for a result that is the lightest brown it can be before it begins to look more of a blonde colour. If you did prefer to use a dye alone, rather than bleach, use a quality salon dye in light ash brown with 40 vol as the developer and process for up to an hour, but do be aware that this might not lighten it as far as you'd like. If your hair has been dyed in the past, this also needs to be taken into account as it can still be bleached light in this situation, but the use of another dye will have little effect in comparison. Any previous dye will reduce the lightening from a subsequent dye. Sorry I forgot to say - the hair color that I am wanting to go for is light beige brown. But won't using a 10vol developer with a permanent dye still render it as a semi-permanent? I've lightened my virgin black hair up to the bright orange stage, I want to tone it down to a light brown, but using a 10vol developer scares me at the fact that it won't actually penetrate my hair shaft - thus, my hair would fade fastly. Please help me, Mr. James! Hi there, i'm Asian with black hair. I read all that you've written here and wanna get a lighter hair more of brown, ash shades. However nothing seems to work without bleach because the hair always looks black and not brown. A friend suggested me to try ash blonde instead to lightening the hair with bleach. I also checked youtube and found videos on the same. There is this color 'Loreal Paris Recital Helinsiki very ash light brown' available only around uk and us. Can I use other ash blonde colors by loreal/revlon/wella? Would it give me the same lightened hair? I have been dying my hair brown for years due to grey starting at 25. I am now 39 and have at least 50% grey hair. That said, it is costly to go to a salon every month to have touch ups. I started touching up at home with Sally Beauty Age Beautiful medium brown which went very dark, almost black. I then tried Wella medium brown again almost black. So today I tried a bleach cap and ION dye in dark blonde and light brown 50/50 split with 20 volume developer. My hair is a lighter shade of brown with a lot of gold. The problem is my grey roots are glowing. Can you suggest anything I can do? I am assuming this is because I went lighter in color but every time I want brown it goes too dark now. Sally worker said do bleach cap over color remover because easier to get color you want after. thank you. I dyed my hair black about a month ago and I hate he color. Absolutely hate it so I went to Sally's and asked the ladies there to help me with what I would need to get it to almost a ash blonde/brown. So I needed up buying a color stripper and my 4 boxes of hair dye. I used the stripper and it came out light brown with orange tones. Then I dyed it the ash color and my roots are blonde, and my hair is black again. What do I do now???? Help! Just wanted to add, I am not looking to be a light brown, rather I have heard that Wella's colors tend to run a level or two darker, so to go the next level up, hence the light natural brown, 5N. Hi, so I am a level 2, virgin, dark dark brown, near black. I am wanting a level 4, and don't mind some reddish tones...would it make sense to use a Wella permanent level 5 natural light brown with a warm level 6W praline?...your thoughts before I take the plunge? Apologies for the late reply. It's perfectly fine to mix the light and medium shades, as long as it's the same brand and dye line. Eg, it's fine to mix any Wella Koleston dye with any other Wella Koleston dye, but not with a different line like Wella Color Touch or a different brand like Matrix SoColor. The result of mixing two shades of the same tone but different levels is that you'll end up with a new dye somewhere between both levels (between a light and medium brown in your situation). If you mix two different tones, the rules of colour theory apply here. Eg, mixing an ash shade into a golden shade of the same level reduces the golden tone that results by adding cool tone to it. This is what beige shades of blonde basically are, for example; golden blonde with a small amount of ash to give a more subtle gold tone. Apologies for the late reply, and I'm glad you've liked my articles! Ombre can be a little difficult if you've never applied any dye or bleach before because you'll be applying the products through the lengths to ends rather than simply all over your hair for this effect. It may be better if you either go to your hairdresser or have someone more experienced help you with it. Of course, I'm perfectly happy to explain how to do it in any case. You'll need to decide how light you want the ombre to be, as well as how long you want it to be. IE, how many shades lighter do you want it to be compared to your natural colour, and in terms of length, do you want it to start from the middle of your hair, or just a few inches from the ends? If the shade you want it to be is no lighter than 2 levels, you can do this with dye by using an ash shade that is 2 levels lighter than your current colour. You can technically go up to 4 levels lighter with a dye, but you will only get this kind of lightening from professional products; I wouldn't recommend going this route for your first dye. If you do want to take it lighter than 2 levels, bleach is easy as long as you can use it safely and are sure you're not going to get yourself into trouble with it. Once you've decided where you want to place the ombre, apply dye or bleach from your desired starting point through to the ends of your hair. With dye, process this until it lightens and tones nicely, or until maximum development time is met. With bleach, allow this to lighten until you like how light it is, or the maximum processing time is reached (this varies by product, so check your chosen bleach powder if needed, but is usually 45 - 50 minutes). Dye will lighten and tone. Bleach will lighten only, and you can tone with a dye if you want to after it is done. Is the current colour that of the photo in the car? If so, you'll still need to get it a little lighter. It's close to a light brown at the moment, but ideally you actually want it lighter than the light brown level. Toning will entail adding blue tone to neutralise the orange, so it actually darkens your hair slightly because more pigment is going into your hair. Getting it lighter than the desired level means that once it has toned, it darkens up to what you do actually want. If you were to go in and tone now, that's perfectly fine and will still lead to a nice shade of brown, but it will by darker than the colour you want. As for the toner, with Wella products, I'd recommend Wella Koleston 5/1 or Wella Color Touch 5/1. The Koleston is permanent, whilst the Color Touch is a demi. Your choice of permanent or demi is really up to you, with a demi being slightly less damaging (permanent with 10 vol is still only mildly damaging though), and quicker to fade. If you want to alter the tone at some point, or change colours after a few weeks, a demi will be a good option because it's going to fade out much more easily. For the developer, 10 vol is fine with Koleston and will work, but 20 vol is better with this particular line of dye. The 20 vol will give longer lasting results if you choose to use it and can help take out a little more remaining pigment if your hair is still a little darker than you want. Whichever dye you do use, I'd recommend applying a strand test first though, just to see how it reacts since you've mentioned your troubles with neutralising the orange in the past. If it doesn't eliminate it fully, don't worry too much. All you need to do is add a small amount of Koleston 0/88 until it does. This is a pure blue concentrate which you can add to other Koleston dyes to enhance the blue tone within the dye. Blue neutralises orange, and this will neutralise the orange tones in your hair if you need that extra toning power. Apologies for the late reply, hopefully you haven't been panicking too much. 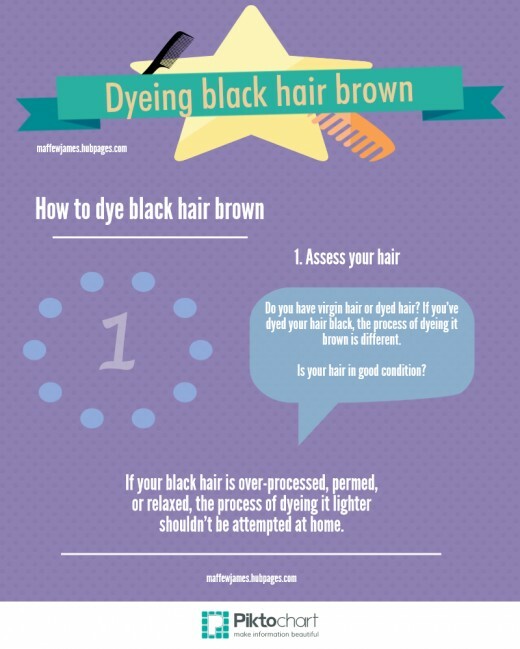 It's common for a dark brown to look black because it is a very dark colour, The advice you were given about filling your hair was correct, but in your circumstance you would have been better giving it a quick strand test first to see how it reacts. Some people have porous hair and this will absorb more dye than usual. This tends to be a lot more likely when you have hair that has been lightened, such as with highlights in your case. No issues though, as you wouldn't have known what was going to happen until it was applied. In future, now that you know you may have a bit of porosity, you may want to consider using a dye that is 1 - 2 levels lighter than the colour you want to avoid it turning out too dark. As for fixing the darkness right now, clarifying shampoo should be fine because much of it will fade out over a few weeks leaving you with closer to a medium brown colour. If it doesn't seem to be budging, this is where you will need to correct it. You can use dye remover for this, but I think you'll find bleach easier. If you take bleach powder, mix this with 10 vol developer in the ratio for the brand you're using (this will be listed on the product), and then mix this with an equal amount of shampoo, this creates a bleach wash which is very gentle and easy to use. Simply apply to damp hair as quickly and evenly as you can, leave for about 10 minutes until it lightens a little, then rinse. I've recently did 2 bleach baths on my dyed black hair and I'm not sure which ash brown to buy. My natural hair is about a level 3. I know to choose a shade lighter than what I want the end result to be and I don't want to be a super dark brunette. Can I mix a light ash brown with a medium ash brown? I plan on using the Ion brand from Sally's. Thanks a lot! Hi there Maffew! I absolutely love you BLOG as it's very helpful. Here is a thing,I have a natural very dark hair color and I'm wanting to dye it to ombre color. I'm just not sure how to start and really need your help. I'm trying to keep everything under the budges. Also I never dye my hair before and this is my first attempt. PLEASE HELP ME. Just opened a photobucket account to show you my hair after bleach bath x 3. Is it light enough for an ash light brown wella toner? Demi or permenant? 10% developer or 20%? Just wanted to say thank you!! Before trying another *sigh* professional colorist for $200 bucks a wack I thought I'd give it another DIY attempt. This thread has been so informative!! I have naturally dark brown hair that has been colored for about 10 years dark brown to cover grey. I'm getting older and would really like to transition to a level 4-5 as I think the dark brown almost black color is really harsh for my age. I've done 3 bleach baths using 20 and 30 volume developer over the course of appox one month and the color is still dark but has orange tinge to it. Could you tell me exactly what color orange I need to reach to be able to tone to a cool level 4 or 5? Also for toning, do I use demi or permenant color? Level 10 developer for depost only with the toner right? I've lifted color in the past and trying to tone out the orange has always been difficult and I (nor 5 professional colorists) have ever been able to take me to a cool light brown/dark blonde. I usually use wella products so what do you recommend for toner? I don't know if this link will work but I;d love this color. Hello. I love reading your advice and I, like everyone, else has a question lol. I had recently got my hair highlighted. I didn't like it as much as I thought I was going too. I then waited for 3 days and went to my local beauty supply store. I explained that I wanted to back to my brown color. She told me to do a filler with a 4N dark brown hair color. I did exactly what she recommended and to my horror my hair is black. I do not like the color at all. I don't know if I was given the right information or if this is natural. I cannot stand the color to the point of it giving me anxiety. I don't have the money to go to a salon. I am comfortable doing it myself. I'm just not sure of the steps I need to take to feel better about this. I don't really understand the whole bleaching thing. Do I just use a bottle that says bleach? Help would be greatly appreciated. Your hair can be porous either naturally, or as a result of bleaching and this is what causes the colour to grab so intensely like this. Most likely it was because your hair had just been bleached. Letting it rest for a few days is a good way to prevent it in the future if you find your hair tends to react this way; otherwise using a clear protein filler, porosity equaliser, or just a lighter shade of dye than what you want will work with the porosity. As for the colour being too dark right now, porous hair tends to soak up colour but then much of that excess washes out very quickly. That with the fact that the Vibrance isn't permanent means you won't need to worry too much. A few shampoos and it should be just where you want it to be. So I bleached my hair to a very light orange, shampooed it out and then used Igora Vibrance 5-1 on dry hair which i left in for 20 minutes. After shampooing, conditioning and then drying, i noticed my hair just looked completely black. A little darker than my natural hair colour. Can you please tell me what i did wrong? I googled light ash brown and most brands put that at a level 5. My goal was to lighten my dark brown hair to a light brown with no warmth. Same colour for the highlights; but you could also consider using a different shade if desired. A warmer shade, for example, whilst leading to reddish hair if used all over, will have less of an effect when applied as highlights because it's only a small amount of hair. Taking this into account, if you add something cool toned as highlights, this cools down the appearance of your overall colour. If you add something warm, this warms up the overall look. As for the difference, you definitely will be able to see it, but the difference between a dark brown and black is very subtle. Dark brown is already so dark as to be very near to black. You might want to go for closer to a medium brown if you decide to do it as highlights (Increase the developer to 40 vol if you do this because you need more lift for the lighter colour). 3A (Dark ash brown), if possible. If not, use 3N. The availability of the ash shade will vary with brand. You also want to mix this dye with 30 vol developer for the necessary lift. Basically, that volume of developer lightens your hair, whilst the ash tone in the dye counteracts the warmth that is revealed during lightening and produces a natural looking brown result. As for specific brands, I'd recommend Wella Koleston 3/0, or Igora Royal 3-0 (Or Igora Royal 4-13; note it's a lighter shade, but the intensity of the ash tone compensates for this. Developer volume determines lift; not how light the level of the dye itself is, which only determines colour deposit intensity). If using a different brand, and the dye is a box dye, pour out the developer they provide and add your own 30 vol developer so that you can ensure it will lighten as desired. If it's salon dye, you'll be adding your own developer anyway. So I have virgin black hair and I wanted to color it like a dark natural brown color. But i don't know which shade of color I should use. I don't want it look like it has been totally colored, I want it to have that natural look. So which hair dye company and which exact shade should I use to get that? Glad you've found it helpful; let me know if you have any problems or any more questions and good luck with the colouring! Thanks so much. You are amazing. With how long you've been dyeing it and the amount of buildup that will be present, your best option to lighten the dye is to use a weak mix of bleach. Normally, dye remover is effective for removing permanent dye, but this will act quite erratically in your situation due to how many dyes have been applied and the fact that there is a lot of grey underneath all that dye. To do this, mix bleach powder with 10 or 20 vol developer, lighten to bright orange, and rinse. Toning with dark ash blonde at this point will take it to a warm to neutral light brown colour; or you can use light ash brown for a cool-neutral to ash result. Following that, when your roots start to show next time, you'd need to dye them with your desired shade of light brown instead of your previous darker colour now, and pull through to the lengths for the last few minutes for an even result. You can gradually lighten it this way over a few months for minimal damage, or leave it light brown. It really depends on how light you want it to be and whether it looks better with regrowth at this level or could still stand to blend in better with a lighter colour. You won't be able to apply a lighter colour on top of the darker colour you have now; or at least, it won't likely result in any lightening. It's just for future reference if you keep having problems with dyes turning out darker than they should. In your current situation, most of the excess colour should wash out after a number of shampoos and you can then consider toning to adjust the way the colour looks if you want to emphasise or soften a tone. If it doesn't, or you want to get the colour to where you want it quickly, another option is to use dye remover to strip the dye back out. This will only work on permanent dye though as it works by reversing the chemical reaction that makes the dye permanent. Other types of dye don't work the same way and won't be affected. You'll still need to dye it again after removal to get it to a nice colour though as if it works fully, it will strip the colour right back to the yellow colour you'd previously lightened to. If it doesn't work fully, it can remove much of the colour but results will be darker and warmer. Either way it's still a good step before considering anything more drastic like bleaching because dye remover doesn't directly damage hair. Onto the toning. With toning, you are always adding colour to your hair, but the colour you add can have one of two different effects: if you want to emphasise a tone and make it more noticeable, add that tone to your hair. If you want to neutralise a tone, add the complementary colour. Complementary colours are: red and green, orange and blue, and, yellow and violet. Eg, if you were trying to soften hair that looks really golden, you need to add violet tone and a small amount of blue to do this. Vice versa, if you were trying to neutralise blue tone for whatever reason, this could be done with copper. Complementary colours act like a pair in that when both tones are balanced, the result is neutral, whereas more of either colour in that pair leads to that colour becoming visible. As an example, if you want to make your auburn more golden, you can do this by adding gold. For this, you can use anything from a permanent dye to a semi-permanent dye or even a toning shampoo, as long as the product is concentrated enough. If the colour was a bit too red for your liking, you might also want to mix a dash of ash into your golden dye to soften this and further push it towards more of a dominant golden tone. Hi Maffew. Thanks for your response. You are so helpful! 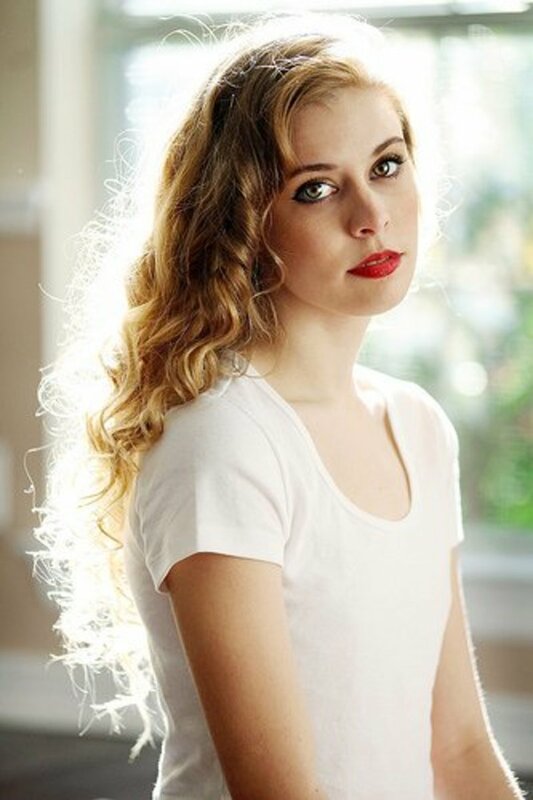 If the hair still looks a tiny bit brassy after I rinse out the light auburn color, is there a way to correct it so that it looks more golden auburn? Thanks for all your help. If that happens with the use of a much lighter dye, porosity is to blame. Most of that excess colour will wash out very quickly. In future if your hair tends to be porous after lightening or just in general, apply protein in the form of a porosity equaliser or clear protein filler and this will help reduce it. Using a lighter dye than the colour you actually want can also help in this situation. I have about 70% grey, and have coloured my hair dark brown with a bit of red for years, I want to go lighter, as I look like a badger when my roots come through, what would you suggest? I forgot to mention...I bleached the hair to yellow blonde and used Wella Color Charm, light auburn (5RG) permanent dye. The hair turned a deep auburn. It's dark again. It's a level 2. Not light auburn like I was expecting. Thanks. The more dark dyes you apply, the less chance that another dye is going to cause any lightening because dye can't effectively lighten the artificial colour of another dye; it only lifts your natural pigment. For this reason, you will have to bleach if you want to lighten it again. As for the reddish tinge, this occurs because there is a lot of dark red pigment in the black dye which forms the foundation for such a dark colour. Best way to get around this is to lighten to the level of brown you want and then use an ash shade of brown dye to neutralise the appearance of the red tone. For a light brown, lift to bright orange. For a medium brown, lift to orange. For a dark brown, lift to red-orange. Whichever you choose, tone at the same level. If you bleached to bright orange for a light brown result for example, you would then tone with light ash brown, and so on so forth for the rest using medium ash or dark ash. Hello, i would like to ask.. i had naturally brown hair but then i dyed my hair to Black a few times.. i want to have Brown hair now and i have tried to use bleach as well and then use the brown color.. but the hair comes like reddish type.. which i really dont like.. so i colored it to black again. Now, I have tried to dye brown many times on my black hair but it still looks black. Please help..
With semi-permanent colours you can use Igora or Goldwell mousse, which are easy to use. Igora 5-1 is perfect, but Goldwell doesn't have an ash at level 5 in their mousse. The 5N can be used for toning instead. Wella Color Fresh 5/91 is another option. You can use demi-permanent and this will be more lasting, but I would recommend applying this in foils or trying to isolate it to the highlighted areas because whilst it's deposit only colour, it does use developer and can cause lightening on any darker hair it touches. This will be very minimal anyway but it is a possibility. Products like Wella Color Touch, Igora Vibrance, and ISO I.luminate. You're still using a level 5 in ash with this route, which is 5/1 in Wella, 5-1 in Igora, or 5A in ISO. Permanent can technically be used if you want, but apply in foils. Whatever type of dye you used, you want a level 5 in an ash tone, and you can tell if this is the case by looking at the colour code. The first number will be 5, which is the level (How dark the dye is), and the second will be a number or a letter. Ash is /1, -1, .1, or A in most brands, but tone codes do vary. Level numbers are fairly strict. There is also a naming convention used by most brands where a level 5 dye is called a 'light brown', and the primary and any secondary tones are used to modify this, meaning you're looking for a light ash brown / ash light brown. This naming convention can vary sometimes too though (Matrix is one that varies slightly). As for the developer, you will only need developer with permanent or demi-permanent dye. Semi-permanent doesn't use it. If using permanent, mix it with 10 vol developer. If using demi-permanent, mix with the specific developer recommended for your brand, which will usually be between 5 - 10 vol developer, or can be an acid developer. For semi-permanent, use the product as is. Overall, you have a lot of options regarding brand and type of dye to use as the toner. If you use the codes and naming as key, you should be able to find one that is available to you. If you have any trouble though, let me know and I'll help you figure out the right shade once you have a brand in mind. Thanks for the advice Maffew! I'm going to go with the bleach and tone method. Are there any particular brands you would recommend? Here in the UK, I find that theres not much variety in semi permanent colours. So would i just look for colours containing 'ash brown' in the name? Also, with the toner, is a 10 vol developer used whether it is permanent or semi permanent? Bleaching is more reliable because it's easy to see how far it has lightened and get it where you want it to be before toning. It is possible to do it with dye though, as long as you haven't already applied any dyes in the past; especially dark dyes, which will usually prevent another dye from lightening your hair further. Ideally, to get the colour you want, you would need to lift slightly more than 2 levels to take it a little past level 4, then tone with 5A in semi-permanent, which can be applied to the new highlights only, or all over, in which case it will tone the previous highlights and take away a lot of that orange there too. How well it tones those old highlights will depend on how dark they are because the use of the 5A will be best suited to toning hair that is anywhere from level 4 - 5. On the new highlights, it will give a neutral to slightly cool result depending on how long you process it for, and the toning will finish the colour up by getting it to the tone you want as well as darkening it up to level 4. This is why it's best to lift slightly further if you have a definite level in mind for the result, because toning will add colour and thus darken slightly. I love how your replies are so informative! I'm hoping you can help me, I'm a level 2, with (half head) 7 month old highlights that are slightly orange. I want to do balayage to a cool level 4. Is this achieved by bleaching and then toning? To get your hair to light brown, you will need to bleach it to a light orange colour first. Following this, apply medium caramel blonde mixed with about one quarter medium ash blonde, to areas you want to highlight, applying in foils. Use 30 vol as the developer for this dye. The ash is necessary here because there will be warmth after bleaching, as well as during the further lightening produced by the dye when highlighting. It will deal with this to give a better looking caramel that doesn't look too orange. Once the foils are in, apply light natural brown to the rest of your hair (Any hair that isn't covered by foils), develop, and rinse everything out once it's done and toned to a nice colour. Use 10 or 20 vol as the developer for this dye. You can mix it as half natural and half ash shades if you want a cooler base colour. The above method will allow you to get all the colour done at once after dyeing, but if you'd prefer to do the highlights separately for more control, this is also fine. As for the bleach, 20 vol mixed with a professional product is fine. For generic products, you can often go as high as 30 vol. Note that in this situation, professional bleach mixed with 20 vol developer lifts more effectively than generic bleach mixed with 30 vol in most cases. The particular brand you're using will list the maximum on-scalp developer volume and processing time that should be used with that product. It's not common for the higher quality brands to recommend anything higher than 20 vol on scalp, or 30 vol off-scalp in highlights anymore as these bleach powders contain lightening boosters that make the product more effective and stronger with a weaker developer. If you do use something stronger with these products, it's possible for severe scalp irritation or even blistering to occur. As for the brand of dye, there are several good brands and it will depend on what you can get. Eg, Wella Koleston and Igora Royal are excellent and dependable products. This page is just what i was looking for, so glad i found it!! 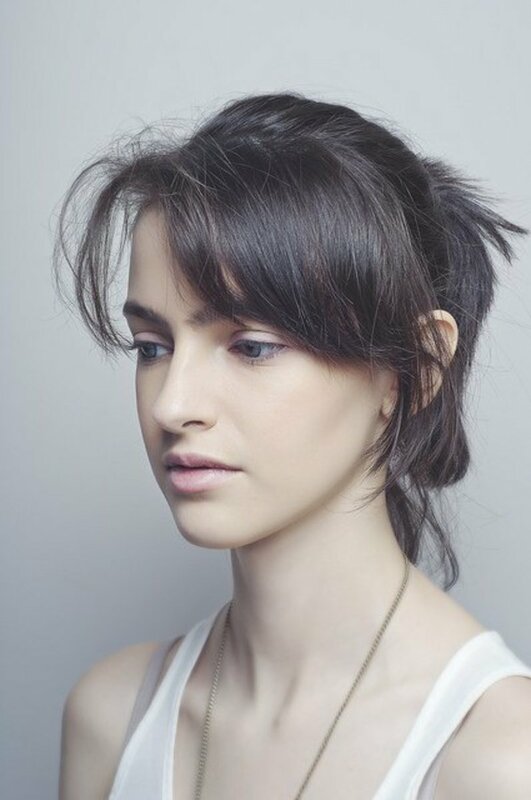 I have naturally dark brown hair ( almost looks black), i would like to get my hair to a light brown base with dark caramel highlights. ( so basically a mixture of #8 as a base and #12 highlights). how to i go about doing this? and what brand of dye and colour do you recommend after i have bleached my hair? You can always lighten it a little in the meantime to blend it better while it grows out. This will lead to more dryness though, so given your troubles with dry hair this is something to take into account and think about first. If you were to do it, you would need to either use bleach, or to use dye remover first and then bleach. The dye remover is a possible first step because it removes permanent dye without damage (Although increases dryness temporarily). It can't always remove much colour when there is a build up of dye though. As for the bleach, this will lighten the black hair to progressively lighter shades of red and then to orange. This warmth is neutralised with ash dye to give a new brown result after lightening. Bleach tends to damage the cuticles on the surface of your hair fairly easily though, as does dyeing your hair often, and this prevents it from maintaining moisture because it is no longer sealed properly. It really just depends what you want to do. If you want to go with the black underneath after growing your hair out, this can be done over time and sped along by lightening it as above. If you just wanted to get to a medium to dark brown colour, this is very achievable and you can do this by lightening to orange and then toning. After that, the brown colour just needs to be maintained with root touch ups and occasional toning to keep it looking good. My hair is 100% gray. I tried "I'm cool with gray" for a while, but just felt too old, so I've been box-dying it black for a while. Now I think the black is too harsh and brown would work better. So right now I have 1/2-inch gray roots on black hair. To make things worse, my hair is naturally verrrrrrrrrry dry. I do all kinds of conditioning just to break even. It's occurred to me that leaving crown-to-ears top of my head gray with black underneath might cure having to deal with roots. But I know how long it takes to grow out dyed hair. Can my hair be helped? It'll be hard to find a product that works for her without causing symptoms unless you can pin-point the exact ingredient that is responsible for the allergy. It may just be the box dyes though, as these can often contain a certain amount of metallic dyes which may also be found in the henna. Of course, there are some ingredients like peroxide and ammonia that tend to cause some level of irritation in the majority of people, and avoiding them leaves you with products that are more gentle on the scalp. This rules out permanent dyes, as well as demi-permanent dyes that are oxidative if this is the cause. She may be able to use an acid-based demi-permanent (No ammonia or peroxide), but the acidity, whilst good for hair, may also irritate her scalp. Other than that, the gentlest type of dye is semi-permanent, but this is more like a stain than an actual dye and it washes out over time. If you have any more insight into what particular ingredient is the cause of the allergy I can offer a better idea of what products may be better; otherwise it's just a shot in the dark. Antihistamines are an option that can be used prior to dyeing to prevent an allergic reaction that isn't too serious, but she would be best consulting a doctor beforehand if this is to be considered an option. Hi! My mom dyes her gray hair once a month but she's allergic to whatever is in the box dye. She has tried henna as well but she's allergic to it,too. She gets burns on her scalp that eventually turns into dandruff-like flakes. Can you recommend a dye for sensitive scalps? Thanks! I'm not familiar with Kroger. Is that a dye brand or a store? If using dye to lighten and tone your hair, I'd recommend only using salon dye. You can't control what developer is supplied with a supermarket dye, so you have no idea what concentration it is. You need at least 30 vol developer to lighten black hair reliably to a brown colour with dye. 40 vol is preferable for a lighter result. Technically, you could add your own developer to a supermarket dye and just throw away the one they supply, but the dye itself tends to lift less effectively with the same developer compared to salon dye. There's often less ammonia and other catalysts in the dye. If you're using a bleach and tone method though, where you bleach your hair to how light you want it and then tone with dye, supermarket dye is going to work for this. Just make sure you use an ash shade and match it up to how dark your hair is. Ie, light ash brown will tone light orange hair to brown, but it's not going to tone darker red hair because it's too light. Ideally, bleach to light orange and then tone with light ash brown for a light brown result; bleach to orange and dye with medium ash brown for a medium brown result; or bleach to red-orange and dye with dark ash brown for a dark brown result. does kroger hair dye work? Were you using salon dye or box dye for this? Box dye has pre-selected and measured developer in a shake bottle and the colour is the tube that is mixed with this. Salon dye is just the dye tube and you select the developer yourself. Without developer, no permanent dye will deposit or lighten. What you do next will depend on whether you used the dye properly but it didn't lift, or whether you actually didn't use any developer. So I tried to dye my black virgin hair to a medium brown color. But I didn't use developer so the color didn't really change. Any advice on what I can do to make it the prefer color I was opting for? Box dyes don't tend to lighten very well. You have no control over the strength of developer that is included with the dye and this is part of the reason why it is less effective. In this case if you will be using this dye and you have black hair, the best route is to bleach it to pre-lighten and then just use the dye to tone and achieve the final colour afterward. As for the dye remover, you can use this to remove some of the dye that you've applied and make the lightening easier but you would still need to use bleach to lighten it further afterward. Dye remover will only remove any colour in your hair that is the result of permanent dye. It can't lighten your natural pigment. It is also not always completely effective when dark colours are used or dyes have been applied several times. For this reason, as well as the fact that you will still need to bleach afterwards anyway, you can give the dye remover a miss. If you do want to use it though, it will help the bleach lift better by removing some of the dye and the remover itself is non-damaging. After this, bleach it to a golden-orange colour for a cool to neutral light brown result, or a bright orange colour for a cool to neutral medium brown result. For warmer shades like chocolate, you can remove it sooner because you don't need to tone it so heavily. A chocolate shade of brown is dependent on the underlying warmth to allow it to look rich. To tone your hair after bleaching, use ash brown for a cooler result, or a mixture of half ash brown and half natural brown for more of a neutral tone. The level should be light brown if you're aiming for that, or medium brown for a medium result depending on how far you decided to lighten it with the bleach. Hi Maffew! my originAl hair color is black. I bought box dye with a shade of light brown from the drug store, my first time, didn't get what i like, it went a shade lighter but with reddish tone... Then after a month or two, re-color it again with dark blonde for touch -ups for the roots and for the whole hair. The end result was ok since I only like subtle changes but I dont't like the reddish tone/shade I see. Its been 3months now, and roots have grown, Am I going To use a dye remover or a bleach? I would like to achieve the natural brown/chocolate brown/ medium to light brown, As much as possible I'm stayin away from the blond shades. What would you recommend?